This is never something that just happens by chance — you have to put yourself out there and work for it, and to do so, frankly, takes courage. It takes courage to ask for new responsibilities at work to show you’re ready for the next step up. 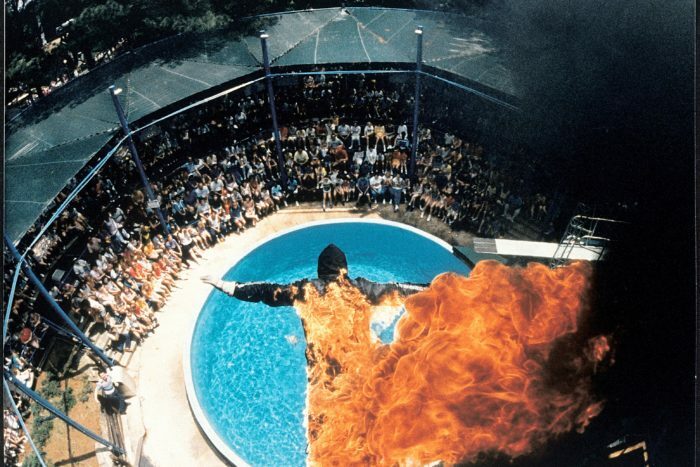 As a former high-diver who is afraid of heights (and who sometimes performed these dives while engulfed in flames), I can tell you all about the crazy things courage will allow you to accomplish if you can find it. So, how do we find courage at work? Courage is contagious — there’s likely someone around you who has taken a courageous leap at work that you can model your own after. But if there isn’t, be that person yourself — it has to start with someone! Modeling a culture of courage where risk-taking is encouraged and understood for the necessary act it is will benefit all. And often, you’ll be valued as a trailblazer for this very reason. While this may sound counterintuitive, the simple fact is that reducing the consequences of a failure makes people far bolder in trying something risky. Have you ever had a manager tell you something like, “Whatever you do, don’t screw up!” or “If you drop the ball on this, you’re toast!” This is akin to telling a diver not to wipe out instead of how to nail the dive. Creating safety nets — essentially, mitigating the negative impact of a particular failure — for yourself or for those you lead will increase the courage quotient in your office many times over. Valuing “forward-falling” failures, experimentation, and letting those taking the risk know you have their back (or finding someone who will have yours) will all go a long way. The goal of harnessing fear is to put its energy to good use. Fear, like electricity, can be paralyzing — but similarly, it’s a very useful resource if it’s channeled properly. The three things you need to do to get the most out of fear is: Normalize it, tie it to courage, and then use its energy. Normalize it — Acknowledging fear makes it more ordinary and lessens any associated feelings of shame. Fear, when exposed to the light of day, especially when shared and discussed with others, loses its hold over you. Tie it to courage — Some believe that courage is the absence of fear. This is incorrect; it’s the ability to act alongside fear, simply not letting it stop us. You can’t be courageous unless you are afraid. Including fear in the definition of courage turns fearful situations into opportunities to demonstrate and practice courage. Use its energy — The best way to deal with fear is to use it against itself. Fear isn’t inert—it has energy. Properly harnessed, fear’s energy can provide the momentum needed to tackle challenging situations. Fear energizes the body—your pulse may race, your palms sweat—that same energy can be used to nail a high dive or tackle a new project. The problem with comfort is that it has a settling effect. When you’re comfortable for too long, you begin to lower your standards. You settle for less, you become less attentive, less ambitious. If you stay inside your comfort zone, your skills will start to curdle like expired milk. As a diver, I was driven by two forces: learning new, challenging dives and perfecting the ones I already knew. Similarly, in your work life you should balance the degree of difficulty and type of task, so that you’re stepping out of your comfort zone on a regular basis, and thus will be more prepared to take a courageous leap when a really challenging opportunity presents itself. As you put your courage to work in 2019, no doubt you’ll suffer from occasional challenges and setbacks. When you do, just remember that achieving goals and trying new things is supposed to be hard! The hard stuff is what courage is for! So plant these two words into your head, and state them proudly and loudly when the road gets hard: Be Courageous! Bill Treasurer is the founder of Giant Leap Consulting and author of five books on courage and leadership, including the international bestseller, Courage Goes to Work. His most recent title is The Leadership Killer: Reclaiming Humility in an Age of Arrogance. Giant Leap has led over 1,000 leadership programs across the world for clients that include NASA, Saks Fifth Avenue, UBS Bank, and eBay. Treasurer is a former member of the U.S. High Diving Team, and attended West Virginia University on a full athletic scholarship.